Kurt Stennhas over 30 years of expertise studying hair. He had a distinguished twenty-year academic career as a Professor of Pathology and Dermatology at the Yale University School of Medicine and was for ten years Director of Skin Biology at Johnson & Johnson. 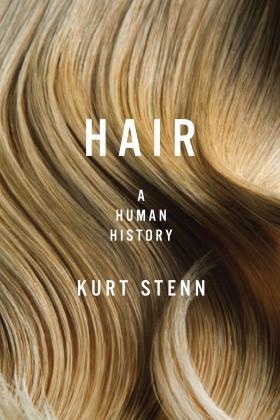 He is the author of Hair: A Human History, out now from Pegasus Books. Since earliest times, humans have used hair-mimicking head covers for societal and political reasons. As recorded in ancient texts, sculptures and paintings, wig use was widespread in ancient Egypt, especially in the life of the royals and their court. It was common for both men and women of the higher classes to shave their heads and then wear full wigs made of human hair or date palm fibers. Not only did wigs decorate the top of the head, but they also embellished the pharaonic chin. Men, and occasionally women wore long, cylindrical chin wigs at court as a mark of authority; these chin-wigs varied in presentations from straight to elegantly-braided. Wig-wearing extended to the high societies of ancient Greece and Rome. So important were these wigs to social life that some noble Roman women kept blonde household slaves in order to assure an ample supply of flaxen hair for their own hairpieces. Wig use waned during the Middle Ages and didn’t return until 1624, when Louis XIII covered his prematurely balding scalp with a long, dark, wavy-locked hairpiece. Said to be the first wig in any royal court since ancient Egyptian times, the hairpiece kicked off a new fashion that persisted for almost 200 years, ending with the French Revolution when royal heads and wigs were separated from royal bodies. In that pre-revolutionary society, wigs broadcasted aristocracy and power. By the end of Louis XIII’s reign in 1643, wigs were accepted as required dress for nobles all over Europe and, in order to supply those wigs, the first wig guild was founded in France in 1665. Wigs were popular in all social classes, though people at the top of the social scale wore the biggest. These massive wigs not only covered the head but also the back and shoulders. In the extreme, an attractive wig would have incorporated into it model ships, birdcages, and flags. These massive wigs were difficult to take care of, as their size prevented regular washing and the powder used to dust them—meant to add a pale patina and made of flour and starch—fed a whole host of bacteria residing on the sweaty scalp. In modern times, wigs remain a booming business. The size of the industry is difficult to evaluate, since wig-making is a fragmented process and there are many participants—hair merchants, wholesalers, fiber manufacturers, wig designers, wig-knotters, and wig beauticians—but workers in the field estimate that the total world market approaches five billion dollars. And modern wigs are as varied as their costumers—whether created because of illness (to give the appearance of good health or to hide a hair disorder); religion (to cover hairstyles or baldness as obligated by tradition); social pressure (to comply with a style or convention); or theater (to look the part of a particular character). Most natural hair in the current market comes from South American and Asia. In Peru, hair merchants drive to villages, set up a tables in the central plaza, and buy hair from the women who line up—the vast majority of whom are very poor and reply upon these visits as a source of income. In India, women donate their hair as a votive offering to Venkateswara, an incarnation of Vishnu who has the power to absolve sins. It is estimated that a quarter of the 50,000 pilgrims who visit temples daily in the Andhra Pradesh region of India donate their hair. The temples then sell the hair—more than one ton per day— to merchants. This hair is the least expensive of the high-quality wig hair on the market today. Though many contemporary wigmakers tend to be uneasy about using synthetic hair in their wigs, there are some incredible advancements being developed for wig use. At Aderans Ltd., a billion-dollar Tokyo-based company that makes and sells wigs serving about 40 percent of the Japanese wig market, engineers are currently developing more realistic synthetic fibers. One new fiber is actually a fiber within a fiber; the internal layering imparts to it greater tensile strength. Another fiber has a roughened surface that acts like a cuticle, in that reflected light gives a more natural reflection. Still another fiber is able to intake water giving it some of the curling properties of natural hair. Such engineering advances suggest that synthetic fibers will increasingly become part of the future cosmetic wig. Futurists envision a new barbershop that will offer much more than our traditional barbering or salon experience; it will embrace the facilities of an all-round Cosmetic Center. It will be a one-stop, “holistic” beauty care community for men and women of all hair types, reminiscent of a food court with multiple stations in a large, easily-accessible area. There will be exercise and nutrition coaches alongside tattoo services, eye- and nail-care stations, hair removal stations (with support for both permanent and transient hair growth cessation), hair transplant stations with robot assistance—and, of course, computer-assisted wig weaving, fitting and repair. Wig production has evolved far beyond its ancient origins, but modern wig-wearers have much more in common with their counterparts from antiquity than meets the eye. The desire to achieve a particular cosmetic look binds Lady Gaga to the Egyptian pharaohs, even though they seem worlds apart. The wig manufacturing industry may be on the verge of even more radical changes, but their clientele wants the same thing from the product.